If you are a dairy farmer and watch every penny in order to remain in business year after year, can you afford to consider compassion as a standard operating procedure? After feeding newly birthed male calves for one week, is it better to lose $5 for every creature you ship to the auction ring, or invest 28 cents on a bullet and add 64 pounds of dead weight to your compost pile? Most farmers in America do not waste the week and in doing so, sacrifice 70 cents per calf food cost to keep a soon-to-be sacrificed infant alive. Most male calves on American farms die withing 24 hours after they are birthed. When eating your next slice of pizza, or sucking up your next container of pudding-like growth hormone-rich Greek Yogurt, take responsibility for creating that demand which results in more animals dying in the above-described manner. If you are inefficient, you have a right to be afraid of the consequences. Can a consequence of compassion result in the reality of bankruptcy on a dairy farm? On November 11, 2014, a typical dairy farmer will be compensated just 34 cents per pound for each male calf that he sells to the highest bidder at an auction ring. A newborn male cafe weighs about 64 pounds, and after a week of cow-milk replacer, the cow is sent to slaughter weighing about 80 pounds. Cow's milk is too dear for dairymen to waste on calves and is better sold as people food. After expenses, that baby cow nets about $25. 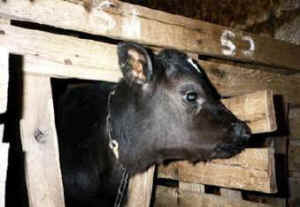 It costs the dairy farmer about $30 to ship that same male calf to the auction house. What business decision would you make if you were a dairy farmer? HINT: The cost of one bullet makes for an efficient dairy management farm tool. If you buy an entire box containing 500 bullets, the cost of one 45-caliber bullet is just 28 cents. A calf carcass composts easily on the farm. The easiest way to kill a baby male calf is to separate him from his mother, then drag the thrashing infant to a ditch and shoot him in the brain with your gun. For a farmer and his young son or daughter, shooting calves in a ditch is a cheaper and more exciting form of bonding than playing video games. Many farmers do not waste the 28 cents on a bullet and instead, prefer the baseball bat to the head approach. Illegal alien workers from South of America's border are happy to step up to the plate and pinch hit for the farmer, in that regard. How widespread is this practice? You'll be sadly surprised. No, you'll be shocked. The Humane Slaughter Act was passed so that farm animals would be "humanely killed" by compassionate executioners with sharp knives, rather then by sadistic fiends taking pleasure in causing pain to defenseless creatures. Why are calves born? To keep their moms producing milk. If calves are unlucky enough to be born male, feed costs no longer justify raising these darling creatures for veal. If you, like most consumers, vegetarians, and animal rights activists assume that most baby male calves are sold for veal, then you are sadly mistaken. There are approximately 9.15 million cows being milked in America. On average, a milking cow gives birth once every sixteen months. That's the industry turn-around, with all things (disease, production, etc.) being factored. So, 6.8 million calves are birthed during each 12 month period. Half of those calves are born female, and are raised to become milking cows like their mothers. Some 3.4 million calves are male. Are these infant male bovines fated to live their short lives in confinement crates, raised anemic so that their flesh contains little fat, while these animals live tortured lives? Well, sure. That's the way it's done to satisfy restaurant patron's craving for baby flesh, or veal. How many of the 3.4 million bulls will be sold in 2014 as veal? Less than one out of five, or about 650,000. How many end up with the bullet option? Do the math. Your calculation becomes their collective sum nightmare. As the public became more aware of the terrible injustices of raising innocent victims for veal consumption, there has been a politically correct rejection of veal. Unfortunately, baby male calves continue to be birthed. Now you know the dairy industry's well-guarded secret about what happens to unwanted baby male calves. Dairymen cannot afford to feed male calves. Bulls do not make great pets. Raising veal calves is a big money loser for all but the largest factory farm operations that do nothing else but raise male calves for veal. Hint: They are not shipped to Pamplona to run through the streets and then appear in bull fights. Hint: They do not appear on Wall Street, or in Merril Lynch commercials. Hint: They are not put out to stud, because most cows are artificially inseminated. If you have yet to come to terms with the process by which thousands of publications in peer-reviewed scientific journals expose the adverse consumption of dairy products on humans, all of which support a NotMilk lifestyle, then perhaps you can examine the issue of compassion as it applies to your inability to face truth. Ninety percent of the cows milked in America are of the black and white Holstein variety. Some are mixed breeds, such as brown Swiss mixed with Holstein or Jersey or Guernsey. Drive through the eleven dairy counties in America which produce 25 percent of our milk supply and you will also observe the black angus cattle grazing upon America's fruited fields of grain. Visit the feed lots and you see few (if any) Holstein males. In their infancy, they have been composted. This dirty secret is an unwritten rule of an industry which paints tranquil scenes on milk cartons. There are thousands of "players" keeping this horror to themselves. A 21st century holocaust of torture and death, pain and emotional distress, occurring away from your sight. Even when video documentation occurs, no television station would violate that unwritten code which would hurt their bottom lines. An intellectually evolved 21st century human's bottom line is to always take responsibility for his or her actions. You may not pull the trigger of that gun. You may not witness the suffering or pain. You do not watch the terrified animal cry while waiting its turn for the bullet. You do not bear witness to the slow death process. Consume dairy products and you become the executioner.